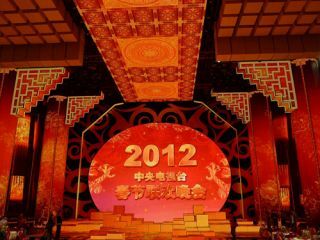 Barco was the primary visual equipment provider for CCTV's 2012 Lunar New Year Gala. The premier stage application was a huge LED screen, comprising 1,326 Barco 6 mm ILite 6 BK LED boxes and covering 273 m2. The show also used 8 super-bright, 20,000 lumens FLM HD20 projectors. HD images were shot on 2nd supporting screen, coordinating with the programs. Working in close cooperation with audio-video technology companies such as Raysee, CTV Technology, Garwin, HPCL, Really AV, Huelead and Bright, Barco was able to deliver a fully integrated installation for the show. In addition, the show used a large number of high–definition video display sources, and these HD signals (HD/SDI and DVI) were generated by an advanced video control system: Barco's Encore VPx4 and SCx1, which reproduced details and ensured four-way high-bandwidth HD signal synchronization. Four 16-bit DX-700 LED processor drivers guaranteed accurate video reproduction.